In 6 folders. Volumes include submissions and transcripts of evidence of individuals and organisations appearing before Committee in Canberra, Sydney, Melbourne, Darwin, Hobart (incomplete). Also 2-vol. Hansard Transcript of evidence (total 1773 p.) and folder containing 4 Hansard proof copies of hearings held in Melbourne on 29-30 June 1982. 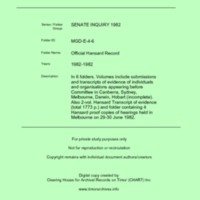 “Official Hansard Record [MGD E4],” CHART DIGITAL, accessed April 18, 2019, http://chart-digital.info/items/show/655.